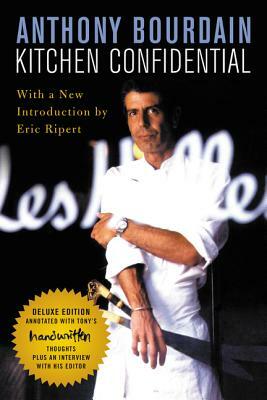 A new, deluxe edition of Kitchen Confidential to celebrate the life of Anthony Bourdain. The book will feature a brand new introduction, a Q&A with Ecco publisher and Bourdain’s long-time editor Daniel Halpern. Interior pages are hand-annotated by Anthony Bourdain himself. The interior will also feature a brand new drawing by Ralph Steadman. Almost two decades ago, the New Yorker published a now infamous article, “Don’t Eat before You Read This,” by then little-known chef Anthony Bourdain. Bourdain spared no one’s appetite as he revealed what happens behind the kitchen door. The article was a sensation, and the book it spawned, the now classic Kitchen Confidential, became an even bigger sensation, a megabestseller with over one million copies in print. Frankly confessional, addictively acerbic, and utterly unsparing, Bourdain pulls no punches in this memoir of his years in the restaurant business—this time with never-before-published material.